We planted our first blueberries bushes four years ago, and they’ve grown from just a few sticks producing a handful of berries to full bushes with loads of berries. I spent time in the garden last night picking blueberries and brought in about four quarts worth and left many, many more still ripening. Monkey Boy pointed out all the blueberries he wanted to eat and snacked on a few, his fingers turning blue from the juice. There’s something about picking fruit, starting with strawberries in the spring and carrying on through to apples in the autumn that brings out the kid in me, and I love to share it with my boys. 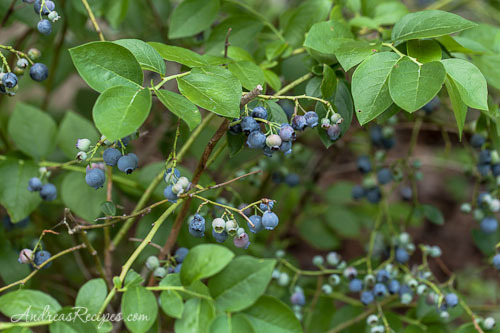 The first blueberries we planted were a Northern low bush variety, and each year we’ve added a few more blueberries, all different types of high bush. The flavors range from sweet to tart, and the low bush blueberries are my favorite, probably because the flavor reminds me of Maine. We chose early, mid, and late season blueberries so there would be berries in the garden throughout the summer, and we made sure to select varieties that would cross pollinate. The birds like the berries as much as we do, so we had to make a cage of sorts to protect the bushes once they start to flower, otherwise there wouldn’t be any blueberries left for the humans. I use small fresh mango chunks to flavor the yogurt base, but you can also thaw frozen mango chunks and use those instead, just drain off the excess juice after thawing so the base isn’t too thin. 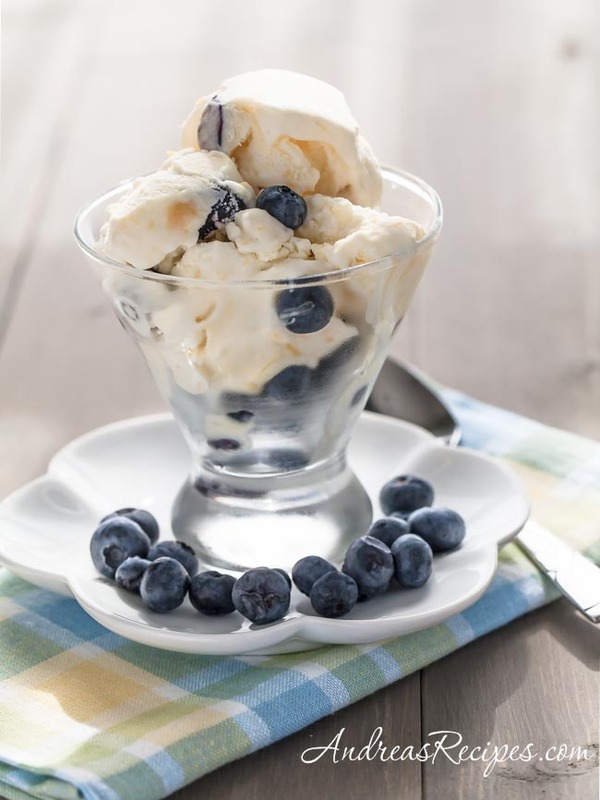 I like fresh blueberries for adding at the end of churning because they generally hold up well and look pretty in the finished frozen yogurt. 1. In the plastic bowl, whisk together the Greek yogurt, whole milk, heavy whipping cream, granulated sugar, and vanilla extract. Stir in the mango chunks, then cover and chill in the refrigerator at least 4 hours to overnight. 2. About 30 minutes before churning, put the yogurt mixture in the freezer to get it really cold. Churn in your ice cream freezer according to the manufacturer’s directions. Add the blueberries a little at a time during the last 2 minutes of churning. Scoop the frozen yogurt into the plastic freezer container, press a piece of plastic wrap over the yogurt, and put the lid on. Freeze until firm, at least 2 hours, before serving. Yes, I am so jealous that you have blueberries! Sounds delish! You GROW your own blues, that’s awesome! Love this frozen yogurt recipe! Thanks Kalyn and Julia. It’s taken a few years to get the blueberry bushes going, but now we really get to enjoy them! If this yogurt is anywhere NEAR as good as what you served when you had us for dinner, sign me up!! Looks amazing. My neighbor has about eight blueberry bushes that we share and I share my veggies with her! There’s a whole blueberry recipe world to discover and I’m looking forward to all that you give us. Have a great day!